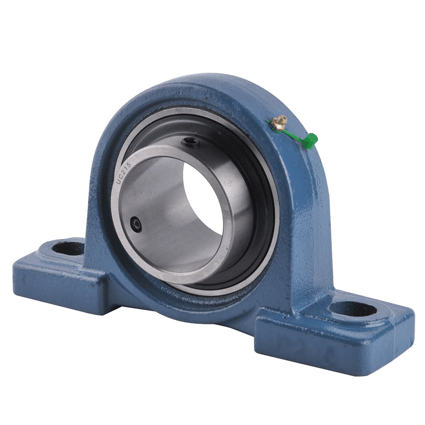 Pillow blocks are housings which have a bearing fitted into them. Pillow blocks are usually mounted in cleaner environments and generally are meant for lesser loads of general industry. These differ from “plummer blocks” which are bearing housings supplied without any bearings and are usually meant for higher load ratings and corrosive industrial environments. The terms pillow block and plummer block are used interchangeably in certain parts of the world. The fundamental application of both types is the same which is to mount bearings safely enabling their outer ring to be stationary while allowing rotation of the inner ring. The housing is bolted to a foundation through the holes in the base. Bearing housings are either split type or unsplit type. Split type housings are usually two piece housings where the cap and base can be detached, while certain series are one single piece housings. Various seals are provided to prevent dust and other contaminants from entering the housing. Thus the housing provides a clean environment for the expensive bearings to freely rotate, hence increasing their performance and duty cycle. Bearing housings are usually made of grey cast iron. However various grades of metals can be used to manufacture the same.